Crisp and delicious red apples - all the way through! Uniquely coloured apple - the flesh is red too right to the core! Imagine making your own red-coloured apple pie, apple sauce or apple juice! Easy to grow - perfect for any garden and gardener.disease resistant and robust. Crisp and juicy, this rosy-red apple has gorgeous red-patterned flesh, making it a striking alternative to normal varieties and a definite talking point in your garden! Not just an ordinary apple, 'Red Love' Era (r) is marbled red through to the core, and because of this is better for you than a normal apple as it is richer in beneficial antioxidants. Plus the tasty flesh doesn't turn brown so they're especially good in fruit salads! Great for newbie gardeners as this apple has been bred with excellent disease resistance and has been grafted onto dwarfing rootstock to produce a manageable fruit tree. In spring, long-lasting, deep pink blossom is produced in abundance, followed by the unusual red apples, making it a perfect feature plant on your patio or decking. Bred to be fully winter hardy, the plants are robust and free-growing and crop reliably every year from September to early October. Supplied as an established plant in a 5L pot, ready to plant straight out. eventually reaching around 2m tall. 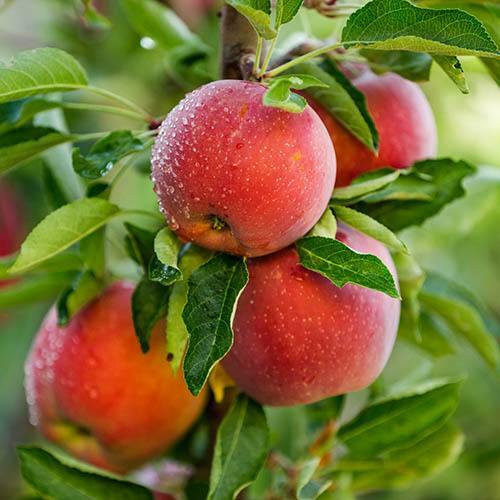 Although self-fertile, you can get a heavier crop by planting with another apple such as Fuji or Gala (apples in pollinating groups 3 or 4). Plant in fertile, well-drained soil in full sun. Suitable also for the back of the border or large pots. Keep well watered until fully established.